Perfume has been one of the most ubiquitous and highest-selling artists in Japan for more than a decade, with a distinctive electro-pop sound backed by a stylish, futuristic image. But the trio’s musical output is only one part of the equation. 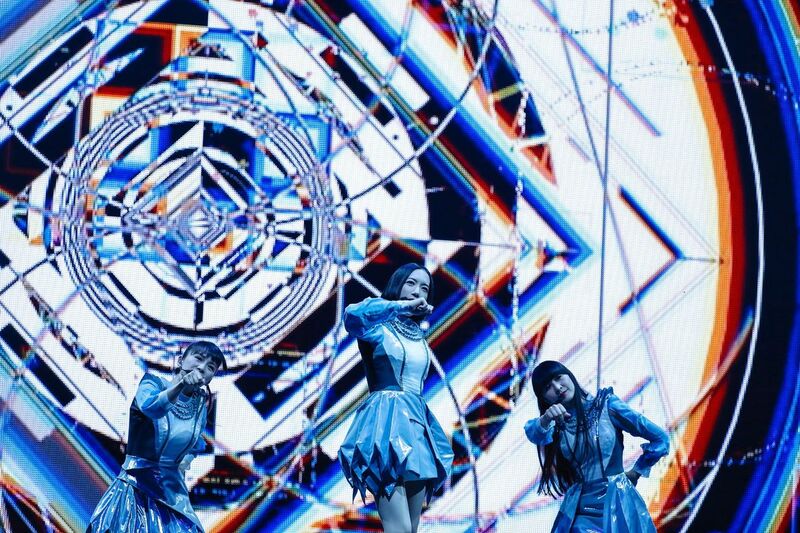 Perfume’s live shows are a dazzling collision of technology and choreography that turn cavernous arenas into sci-fi wonderlands. 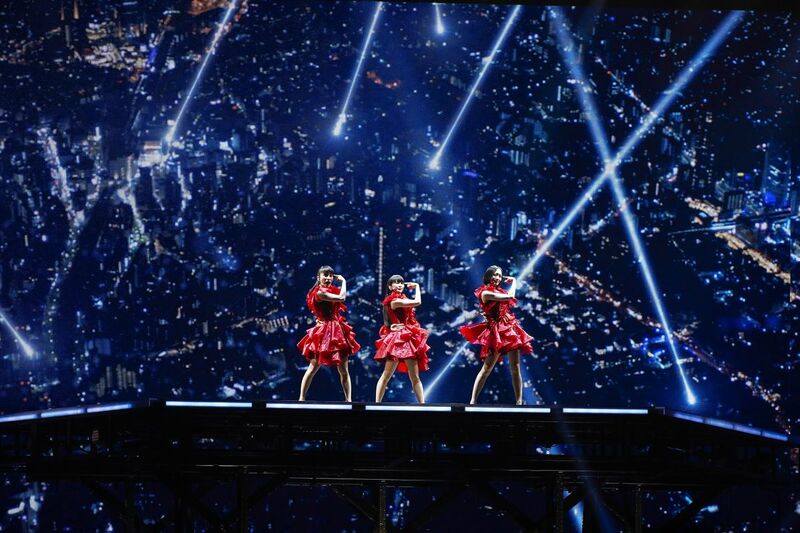 Perfume’s Future Pop world tour hits North America tomorrow with a show at New York City’s Hammerstein Ballroom. 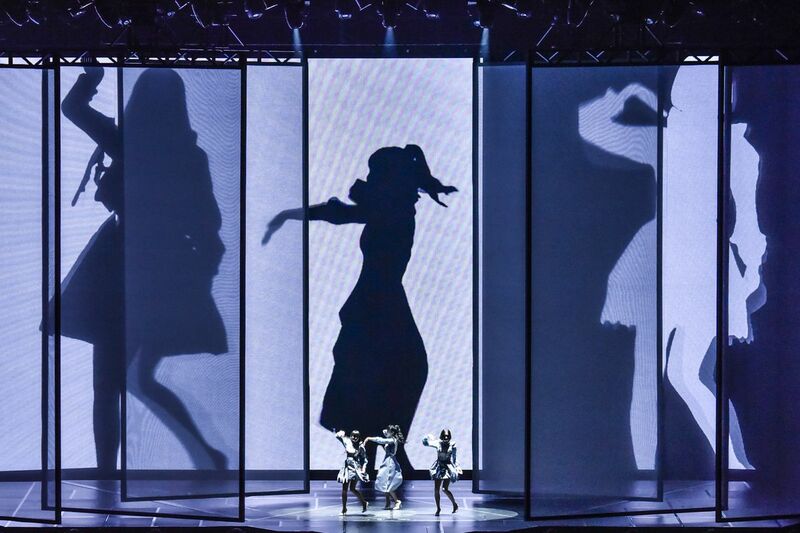 I went along to the Yokohama date in December last year, then met with the group — as well as the mastermind behind its live production — to find out what’s behind Perfume’s fusion of tech and pop culture. Perfume formed at a talent academy in Hiroshima around the turn of the millennium, but the group’s popularity skyrocketed with the release of 2008 album GAME, which turned out to be one of the more influential records in recent J-pop history. Producer Yasutaka Nakata built upon the Shibuya-kei-influenced electronica of his own Capsule project to turn in a tight collection of innovative techno-pop songs. 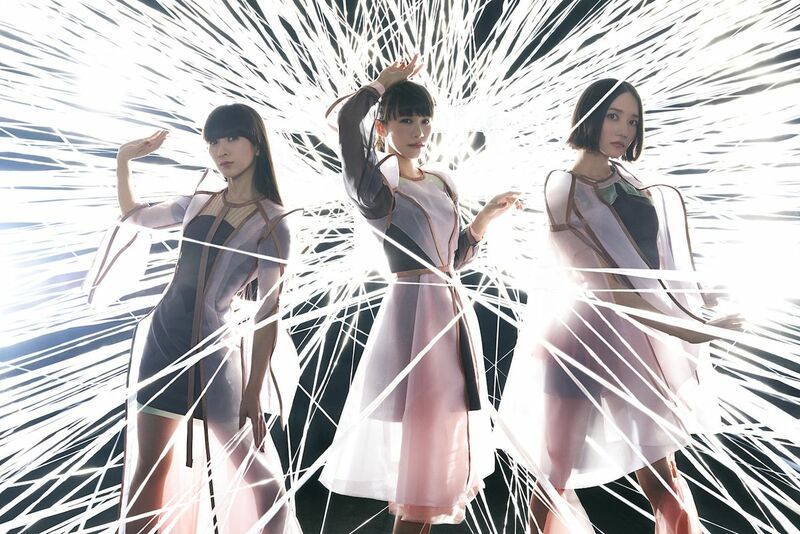 Perfume rose to prominence well before the global EDM explosion, so the futuristic image felt like a natural fit for Nakata’s electro productions. “When we were younger, we actually practised singing like divas,” says Ayaka “A-chan” Nishiwaki. “But when we first met Nakata and started to do electro music, that image was connected with robots and one thing led to another,” adds Ayano “Nocchi” Omoto. 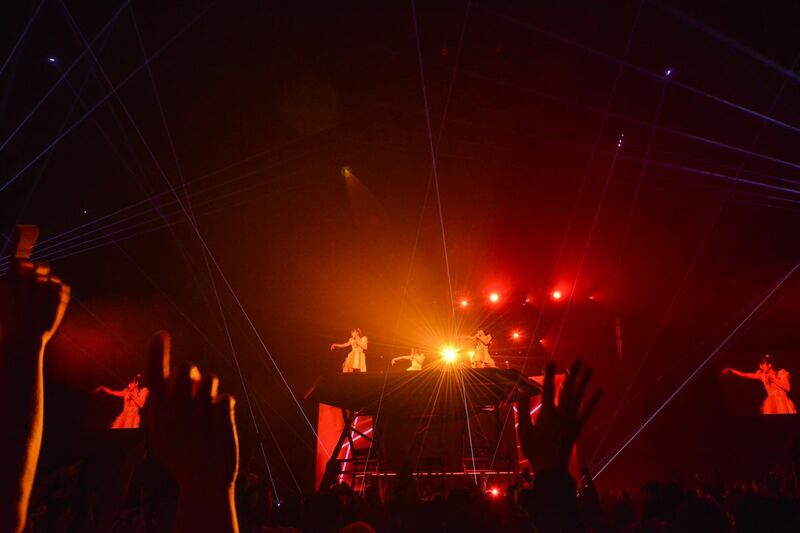 They certainly do that — Perfume’s live shows are like nothing you’ve seen before. Using advanced motion-captured visuals and complex transparent screen arrangements, each song has an aggressively stark aesthetic that elevates the choreography and the music itself. The cutting-edge live production is largely the work of Rhizomatiks, an experimental art collective founded in 2006 by Daito Manabe, who also directed the “1mm” music video below. I met with Manabe for about an hour at his Tokyo studio, and much of the interview involved him showing me various mind-blowing work in progress on his MacBook Pro. Rhizomatiks has so many projects going on at the same time that Manabe has to keep track of how the technology is shared between them with a flow chart that looks like Tokyo’s subway map from 300 years in the future. For the Future Pop tour, however, Rhizomatiks are using consumer gadgets as part of the production for the first time. The song “Tiny Baby” sees the three members each perform in front of an iPhone X attached to a microphone stand; their faces are displayed on large screens above the stage, and the iPhone’s TrueDepth camera is used to show various effects like words popping from their mouths. 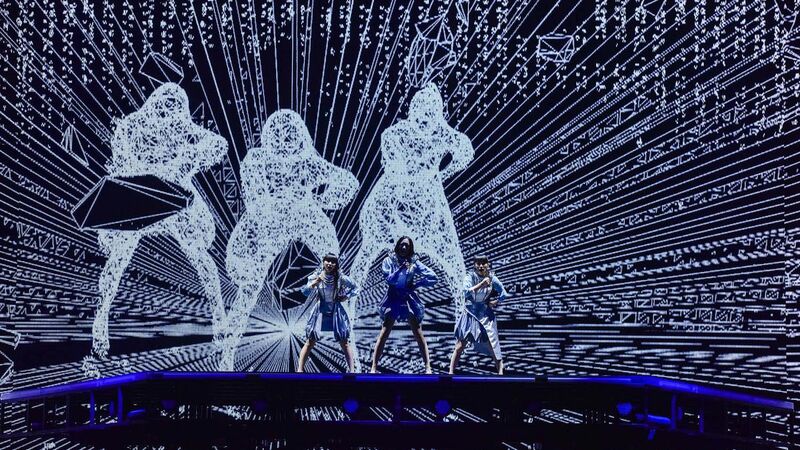 Apart from the Future Pop tour, Perfume’s time in the US also takes in a couple of performances at Coachella, which by necessity will be a far more stripped-down production. I first saw Perfume at Osaka’s Summer Sonic festival in 2011, and as you’d expect it was a very different experience — there’s only so much you can do in daylight with limited changeover times. The obvious question, then, is what’s the future of Perfume’s future pop? “Only Nakata knows!” says A-chan. “We believe in him so we’ll follow wherever he’s leading us to,” agrees Nocchi. Manabe, meanwhile, is constantly thinking about new technology that can be used for live performances — he’s particularly interested in generating visuals through FMRI (functional magnetic resonance imaging) brain-scans, although he concedes the idea is probably better suited to the home than the concert hall. This is something Rhizomatiks is already working on. Manabe showed me a video demonstrating the concept, albeit only with a few phones connected over a cable. It would be possible to use Wi-Fi for a small number of devices transmitting compressed video, he says, but the tech couldn’t be deployed in a crowded arena without 5G.